Not everyone has thrown up their boots and called it a week already and Gully Boy star Ranveer Singh is one of them. 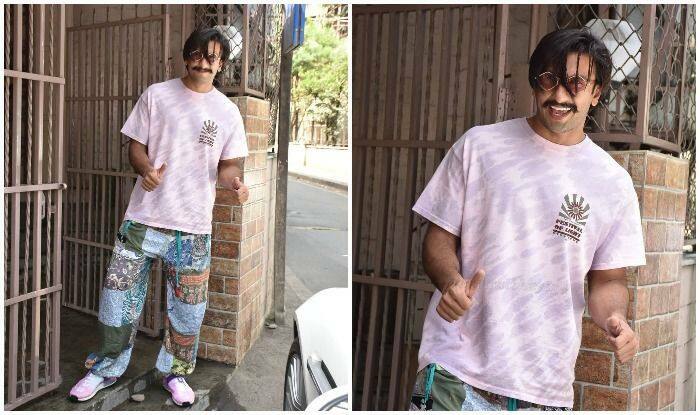 Papped outside a recording studio in Bandra, Mumbai, the actor was seen is his signature quirky attire. Donning a light pink coloured tee that said ‘Festival of light,’ Ranveer teamed it with a pair of multi-coloured bohemian pants. A pair of unicorn shaded sneakers and a honeycomb framed, yellow transparent pair of glares completed his look. Obliging to the shutterbugs, Ranveer smiled candidly for the cameras as usual. Recently, Ranveer collaborated with filmmaker and musician Navzar Eranee to launch IncInk, an independent music record label. Promising to be inclusive and independent formed by artists for art, the label launched Zeher, its first single and music video on Thursday. As of now, the label presents Kaam Bhaari (who has sung Zeher), Slow Cheeta and Spitfire as fresh talents.